One of the best purchases I ever made was a set of reusable eco bags. I use them every time I go to the grocery and always get compliments from the cashiers & baggers. I tend to keep a set of seven bags in my car at all times and grab at least one every time I go in a store. Since they fold down small they are easy to fit in your pocket or just in your hand. Another benefit is that they are very strong. I have put ~50 pounds worth of items in one before without any issues. 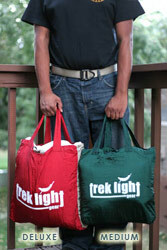 Because the Trek Light Eco Tote is made with the same durable material as the Trek Light hammocks, it means it’s both ultralight and incredibly strong. It packs down so tiny that you’ll have no problem keeping one with you on your key chain or keeping a pack of them in your car or backpack at all times. Perfect for city dwellers who want to make the switch to reusable bags but can’t afford to carry the extra weight or space around all day! They’ll never rot or mildew and they can be cleaned easily for year after year of use.